This set of MATLAB Problems focuses on “Modeling – 2”. 1. We _______ simulate circuits in MATLAB. Explanation: Not only by blocks, but electronic components are also present in the Simscape toolbox. We can simulate the working of circuits via this toolbox. We would need a source and the scope to generate and view waveforms of input and output respectively. Explanation: It is not present in the section mentioned in semiconductor devices, diodes and special purpose diodes, don’t exist as separate sections. It is really present in the sensors section since it acts like a sensor only. 3. Where is the following block present? Explanation: This block acts as a source and hence it’s placed in the Source section. This is different from ground. 4. The output in the scope is an analog signal. Explanation: The output of the scope always shows as an analog signal. It is recommended to use other means of realizing digital outputs such as bulbs. 5. The Battery is also viewed as a charge dependent source. Explanation: The battery can be modelled with an internal resistance and an internal capacitance. Hence, the above statement is true. Explanation: The impulse function can be modelled by choice and it doesn’t matter how much we want to delay the impulse function nor the fact that it’s continuous or discrete. 7. What does the following model portray? Explanation: We are giving a discrete impulse signal to the system represented by the transfer function which is that of a ramp function. 8. What does the following model show? 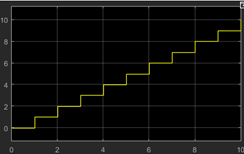 Explanation: The transfer function represents a ramp function. Now, the scope shows a graph starts from t=8 units in time and goes to 1 at t=9. Thus the impulse input given to the graph is actually shifted by 8 units in time. 9. What does this block do? Explanation: The above block gives a 1 if the input is strictly greater than it’s previous value. It returns a 0 if the input is less than or equal to it’s previous value, as defined in SIMULINK TOOLBOX. 10. What does this model do? Explanation: A second order integrator block contains two output ports. The upper one integrates the input once, while the below one integrates the input twice. If we keep on integrating the impulse function, the output of the upper block will be a step function and that of the below one will be a ramp function. 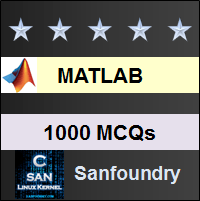 To practice all areas of MATLAB Problems, here is complete set of 1000+ Multiple Choice Questions and Answers.